Will Say’s law stay dead? The generally regarded zombie idea of Say’s law seems to be making a resurgence. A restatement of Say’s law is “production of commodities… is the one and universal cause which creates a market for the commodities produced”. Or in more common parlance, “supply creates demand”. A current problem is the rather widespread use of Say’s law and its variations to argue against government spending as a means to increase economic activity and employment during a recession. Believers in austerity have Say’s law in their mental model of the economy and are creating havoc in political debates across Europe and the US at this critical juncture. The now viral Keynes v Hayek rap videos express the ideological battle quite clearly, depicting some kind of debate between two economic philosophies within the discipline. Unfortunately, one shouldn’t consider this rap to be representative of the community of macro-economists. In fact, according to a survey of Australian economists 76% strongly agreed that a substantial increase in public spending is an appropriate response to a severe recession, with only 15% disagreeing*. Over at a popular Australian blog there is plenty of discussion of this ideology. It is ideology, because these writers cannot translate their beliefs into practice. The basic idea is that if the supply curve moves due to investment, the demand curve doesn’t even have to move because prices will adjust to the new supply. New supply drives growth. But this assumes that the whole demand curve exists, not just the point that clears markets, as the theory suggests. It also assumes that owners of capital will invest in the absence of demand at current prices, which is a stretch to say the least. Property developers for example, usually sell before they construct. But here’s the rub. Consumption is using things up. But spending is not. And that’s what the call from most macro economists has been for – more spending by government. The trade-off that adherents to Say’s law suggest is typically expressed as the pink line in the graph below. In fact exactly this graph was used by one proponent explaining their position to me. Put simply, the more consumption, the less investment. Government spending, even in a recession, is apparently counterproductive for long term growth because all those resources devoted to extra consumption could have been devoted to greater investment. But the difference between investment and consumption is not at all obvious when you think about it. Take cash payments to household as an example of government stimulus that is likely to be mostly consumption. Now consider what the typical household budget looks like. Take the ABS Household Expenditure Survey (HES) data in the below chart as a guide. First up we have expenditure on current housing costs. This includes items such as rent, mortgage repayments, and repairs and maintenance. Is this consumption? Or are repairs an maintenance actual investment in the housing stock? We have food and beverages. We could probably call all of that consumption, but I doubt there is a large marginal change in food consumption following a once-off increase in income. Transport is the third highest expenditure item, and one that is most sensitive to changes in incomes. A large share of this expenditure is purchasing and maintaining vehicles. That is, investment in the stock of vehicles. We have household furnishing and equipment. That is almost purely investment in capital (goods that return a service over long periods). New appliances, new furniture, new curtain, carpets are all investments in the housing stock. We have clothing and footwear. We might think of this as consumption, but in reality new clothes add to the nations ‘capital stock of clothing’. Most clothes last a few years. So we are all wealthier for this, even if indirectly by the flood of clothes onto second hand markets. The separation of investment and consumption is less clear that is seems. What we forget is that their is no definite boundary between the two. And we also forget the spending includes spending on newly constructed capital. New capital is simply goods we consume over a long time period. 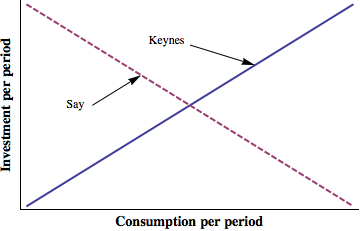 There is no trade-off in the short term, and the blue line labelled Keynes in the above graph more accurately represents the relationship between investment and consumption. We also forget about the second round effects. Spending ends up as revenue for producers who can themselves spend on improving their own capital stock. Those property developers waiting for enough sales to reach their hurdles before construction might just invest following consumer spending on housing. It really is time for Say’s law to die. But the willingness of those entrenched in the economic profession to continue to mislead for their paymasters means that this is not likely to happen soon. *In fact, if you read the whole survey you might find that as a group they could be perceived as not very pro-market, or not what you might expect from the media perception of the economic debate. For instance, most agree that some restrictions on the free flow of capital significantly assist the stability and soundness of the international financial system. Most strongly agreed that the First Home Buyers Grant should be abolished. Most thing copyright protection periods should be shortened, and 74% agreed that a national excess profits tax should be levied on mining industries. Hell Rumples have you gone stark raving mad on us as well? You’re stretching the definition of capital way too far. Capital investment results in a future income stream. Now it could still get fuzzy but it’s a lot less fuzzy than your use of the term here. The idea that consumption brings forward production in an economy is just totally wrong. In the world yes but we are not yet a one world economy. Increased spending, as we are currently structured, doesn’t end up as revenue. If every time it goes round in the dynamic loop you get 50, 60 70% hived off into imports it mostly ends up as debt. So your Govt largesse, resulting in Govt deficits in a nation already running a chronic CAD, results in an increased CAD and more foreign debt. You don’t get anything for nothing without working and producing it. Let’s be very clear. Capital investment results in a future stream benefits, ultimately from consumption. A new commercial building provides the land owner rents, which come from the revenues of the tenants, which comes from the consumption of individuals. Capital is the stock of “stuff” in the economy at any point in time. It includes buildings and infrastructure. It also includes the fit-outs of buildings, including furniture. Maybe an example is more clear. A coffee machine – capital or consumption? Does it depend whether it is at a cafe or in my kitchen? Of course not. So if I spend my stimulus check on a new coffee machine I’ve increased my household’s capital. If a cafe owner does it, they’ve increased their capital. Now your point about the CAD is not so much about what goods are used for. We can generate a CAD by only buying capital goods from foreign countries. The CAD is the result of distribution of ownership of assets, like land, shares, bonds. We buy goods (capital and consumption) from foreigners and sell assets. Over time we have to send the returns on those assets abroad, which are often used to buy more assets. We then balance the accounts by buying more goods. Capital makes us wealth, and the distribution of the ownership of assets is what determines the distribution of that wealth across society. Your view of capital and consumption goods is not within the realm of economics, unfortunately. You are dealing purely in semantics. My girlfriend often jokes that she’s made an ‘investment’ by buying new clothes; she’ll realize additional utility from the investment each time she wears the dress in the future, ergo, by her everyday usage of the word ‘investment’, that dress can be classed as a capital good. Buying the dress is an investment in capital, wearing it is consumption. Virtually every good and service can be termed either capital or consumption so long as you can play the semantics game. There’s nothing wrong with your overall point regarding the crowding out of private investment during recessions; there’s no reason why governments shouldn’t spend (preferably on infrastructure) when the private sector is obviously going to under-invest. The notion of crowding out during recessions is not convincing. But there’s no need to muddy the argument by trying to tell your readers that buying a new flatscreen TV and comfy sofa are ‘investments’ in your ‘household capital’. You’re just aiming for iconoclasm by rejecting a basic concept in economics that purchases by households are typically consumption. Construction spending is the exception to the rule. my only disagreement is drawing the line at households. From a macro viewpoint this is very odd. Like saying that if we had lots of taxis we would have more capital than each household having a car. Not sure about that. But once you start with exceptions like construction, you are basically back to my point that “the separation of investment and consumption is less clear that is seems. What we forget is that their is no definite boundary between the two”. No there aren’t definite boundaries, at least in terms of individual goods themselves, but the distinction between capital and durable goods, if you want to use the taxi and household car example, does serve a purpose. It denotes the manner in which that auto is ‘used up’. Classed as capital, a good is used in the production and supply of a good or service to someone else. Whereas if it is classed as a durable good, it is not used to provide a good or service to someone else. It may seem odd, but distinguishing between capital goods and consumer durables is just a means of separating the manner in which a good is used. An economy with only consumer durables, only ‘capital goods’ intended for use within a household, is that none of those goods are capable of producing anything intended to be exchanged, so there is essentially no economic activity. Hence it makes sense from an analytical point of view to distinguish on the basis of the usage of the good. Why is that? Can’t household sell things to other households? Can’t the goods be sold to businesses to produce things for exchange? They can, but that isn’t production. You haven’t produced anything when you sell and second hand car. If you’re a household that owns what we’re calling a consumer durable, but you actually intend to use it to produce things for other households, then guess what? You’re a firm. They can, in which case we’ll then call them capital, as they’ll add to the economy’s production. Until those goods are intended to produce for exchange, it’s just convenient from a descriptive viewpoint to call them consumer durables. Otherwise you end up with the farcical situation we began with where we’re talking about the ‘capital stock of clothing’. I know what you’re saying and it’s fine if you want to be the standard bearer of a new economics. You’re not alone. There’s just more important fights to be had in the field that this. And that will include working and producing in the future, to pay back the borrowed money for imports of consumed goods. But I am sure Rumplestatskin understands these implications. The capital investment just doesn’t take place where the debt-based consumption is occurring, but nevertheless it takes place somewhere. The connection between government deficit spending and the CAD is a potent argument against government deficit spending, whether you think “Say’s law” is validated or invalidated in the process. I still find the “malinvestment” hypothesis of the Austrian economists convincing. Bubble and bust phases will result in periodic excesses of capital of some kinds. The fact that countries with consumption-based CAD deficits will one day have to export their way back into credit, and exchange rates will reflect this, means that the countries doing the investment in capital goods now, will have to consume something from their debtors economies one day. So Say’s = Build it and they will come” = what China is doing. Now if this indeed turns out to be as wrong, as you suggest, then the future looks grim…. What if, as in China, “they” are “priced out” of “coming”? In a properly functioning market where what is being supplied is indeed meeting the market according to what the consumers need at the prices they can afford, I see nothing wrong with Say’s law. “Planning gain” (or its equivalent) in real estate has to be the ultimate “malinvestment”; in fact it is not even malinvestment, it is “sunk” over-payments that bear no relationship to actual productivity. Actually, you’ve struck a very subtle point. Say’s law basically says that supply equals demand, so if for some reason you boost supply, we will adjust to demand it (prices will fall). But most applications of Say’s law are that you need not demand it at all and the private sector will build it anyway. This is clearly not the case. There would be no ghost cities in China if private developers were running the show. There was demand from the CCP to built it, so they were built – whether or not there was any demand for occupation of the buildings. Most adherents to Say’s law have the view “don’t come now and they will built it anyway, and wait for you to maybe come a little later”. In China, they can keep doing what they’ve been doing as long as they like. The ghost cities may crumble before they are occupied, but they will simply build more, or learn from this and build other things, like rail networks and so forth. Hm but that is NOT actually Say’s Law. It’s a convenient Keynesian distortion of Say’s Law. Say’s law is a far more dynamic concept. The problem of course is that producers, especially of large capital projects (buildings, ships, trains, infrastructure etc), sell before they produce. They don’t build on speculation of future demand. But in the next breath Say seems to explain that this producer will “open a vent for other products by their demand”! “The problem of course is that producers, especially of large capital projects (buildings, ships, trains, infrastructure etc), sell before they produce. Actually, I think they mostly do. I don’t know if I’ve just misinterpreted that quote, but I read Say’s paragraph to effectively mean: ‘if i create more supply into the market my own demand from the market will increase (as I now get a paycheck and can afford more goods)’. It sounds like his rule is being interpreted as ‘if i build a toaster then all of a sudden someone somewhere will want a toaster’, but i actually think he’s saying ‘if i supply the market with a toaster then i will have the money to demand a kettle’. I mean looking at his words: the producer is anxious to sell it, but he doesnt want to hold money since money’s value is perishable, so the producer wants to purchase some product or other with the money he gained from selling his product. Thus the producer creates something and then wants something in return..
Say’s law might work in a deflationary environment. But since we have only ever experienced an inflationary environment in our lifetimes, it’s almost impossible to prove. It might be unwise to dismiss it though. We must all look to Japan. Has Say’s law shown any credibility in domestic-only products? Janet that’s not what Say’s law actually says. Note I’m not arguing for Say’s law. What worries me is the tendency to distort what it was all about in order to justify Keynesian (nominally but not actually) rubbish. This is where I ran into a problem and it is simply not true. Most believers in austerity simply believe that economies have for so long been distorted by excessive credit and govt spending that, indeed in your terms here, supply is not related to demand. This applies right down to the education system. So your argument re CAD is a bit specious. We are talking a long term chronic problem that is symptomatic of major economic and social distortion of the society. Associated with this is the idiocy of saying an economy has an output gap when the output was based on a massive creation of debt. This is plainly nuts. Re fuzziness of definitions, your coffee machine is a consumption item. It produces nothing…it just consumes. Now a loom that makes cloth for clothes? Yep that starts to get damned fuzzy. So I do agree the definitions aren’t exact but you are generally drawing way too long a bow on this to justify the argument. Further I’d argue again that it is a dynamic not a static. The effect of your capital purchases depends on the type of purchases and on the existing structure of your economy. There is no one rule fits all. Some return to ‘common sense’ economics is imperative. You are right that the CAD – as in the external balance – is important to the idea of austerity. But it has nothing to do with private credit and government spending. It has to do only with international purchases of goods and assets, and is the result of selling assets to buy goods. The assets create a stream of revenue, while the goods we bought have not, even though they have increased out productive capacity (foreign vehicles for example). The reason for the structural imbalance is that we continue happily selling assets to foreigners and buying goods. We could easily change this. We could start to balance the capital account, so that every asset we sell to foreign countries, we buy another. So you say that our CAD is structural so that any increased spending from private or government sector simply perpetuates this cycle – yes its true. I certainly believe we need to address global imbalances, but with every country trying to do the same thing it will be politically very difficult, actually I would say impossible. If CAS countries react to our policies to maintain their surplus, then we are simply then playing currency wars, where there can be no winner. Coordination is required. We can’t address global imbalances only our own. Cutting over-consumption (and sale of assets) is part of that process. Unfortunately this is labeled as ‘austerity’ by those, from both sides of the economic and political spectrum, who are desperate to continue on the course we’ve been on. We can change it but not easily. The distortions of western society have gone on for so long that they are ingrained in our economies, our societies and in ourselves. Our economic system has penalised production vs consumption for so long we have massive facilities for consumption but little left for production. What production we do have is mostly foreign owned. The distribution of populations is tuned to consumption vs production and in this I refer you to your post last year on the structure for urbanisation. Our education system is distorted. Over 50 years it has paid to be a lawyer, an accountant, a salesman, a very ordinary company executive, a shop assistant etc vs being a scientist or an engineer, or,until recently, a high tech welder etc. Now we don’t even have the teachers with the necessary skills so we have to start with a whole new generation of teachers. Out tech colleges are now concentrated in ‘lifestyle’ courses and the technical teachers are all gone and not replaced. The apprenticeship system is largely a shambles. Lastly we come down to ourselves with all our sense of entitlement that the evidence is that we will not give up easily. We are quite clearly ready to sacrifice our children’s future rather than give up our own entitlement. Nuff said! I think economists, politicians, and indeed our society itself, underestimates the damage that has been done by the economic insanity. It’ll all come right one day. The fact that countries with consumption-based CAD deficits will one day have to export their way back into credit, and exchange rates will reflect this, means that the countries doing the exporting and accumulation of credit now, will have to consume something from their debtors economies one day. Meanwhile, it is us who will have become the lower-value economy and them who will have become the higher-value one. Bretton Woods is the only thing I can think off, and even then Dulles killed off the Keynes’ Bancor, which one may argue would have prevented long run trade imbalances. The lack of coordinated efforts points to why we should embraces recessions. i would assert that during a boom, all parties along the supply chain take extraordinary profit. They all won’t volunteer to rescind their prices. They will all game each other. So, we need to take the decisin making process out of their hands, and kill the beast. I think you have redefined capital. Capital or producer goods are things that indirectly satisfy preferences, because they can be used to produce consumer goods and preferences. Another important point is the distinction between consumer and producer goods is in the mind of the individual. To your example of a coffee machine and if its capital equipment for a cafe or a consumption good for the home. In the cafe it is being used productively and earns a profit, which allows the cafe entrepreneur to attain more consumer goods. The coffee machine itself doesn’t directly satisfy his preferences. While the one in your house is being used to directly satisfy your wants. Hence it is a consumer good. Are saying an object can be capital or consumption depending on its owner’s identity? That doesn’t seem like a useful guide for anything. Rumples…as per capitalist…it may not be simple but that is the reality. These things are dynamic. It depends on where you are as to what is best for you next. So is it a useful guide for anything…yes it is. It’s a damned good reminder that things aren’t that simple. Re the coffee machine…if a nation is deep in debt, and doesn’t grow any coffee, the coffee machine is hardly an asset because anything it produces results in more debt for the nation. OTH a tractor to grow wheat probably makes perfect sense…perhaps even one to grow coffee! Again oth a nation rich in production may well enjoy the fruits of production by having coffee without creating debt. Are saying an object can be capital or consumption depending on its owner’s identity? I think he’s saying it’s capital or consumption depending on how it’s used. Another example might be a car – for a taxi driver it’s capital (earns their income), but for a car collector (or, say, anyone who buys it for leisure) it’s consumption. Yes in the Austrian school it is based on the individual’s preferences. We don’t view things in terms of aggregates. Personally, I view this subject 180* in reverse. “Demand” = goods and services offered. DEMAND is created by the producer of goods, because the product of labour is subject to the natural laws of entropy. The farmer’s produce spoils. The manufacturer’s product too has a “shelf life”. It deteriorates, or is superseded (although in the drive to make sales, clever/dishonest “marketing” often convinces us of competing product “advances” that do not exist, or are superficial at best). The product of labour is compelled by the natural laws of entropy to find a buyer promptly. If it does not, the producer – who has no personal use for surplus – inevitably suffers loss. He wears the “carrying cost” of deteriorating product if it remains unsold. This is the inevitable – and inequitable – consequence of adopting a form of currency that can also be perceived as a “store of value” (eg, by using currency limited by commodity supply such as gold/silver, or, by offering to pay interest on deposits). Whilst ever currency is not merely seen as a medium of exchange, but is also perceived to be a store of value, the Supplier of currency (the buyer) is granted an unjust and unfair power over the Demander of currency (the producer/seller). The very form of the currency itself naturally encourages its possessor to mistreat and humiliate his fellow man, by taking advantage of the relative weakness of his bargaining position. And arguably worst of all, the one who is disadvantaged is the producer of goods. The engine, the very heart and soul of commerce and industry. Simply by virtue of the possessor choosing to “save” his currency – since he also perceives it as a “store of value” (that earns “interest”) – the producer is forced by necessity to continually and ever more urgently lower the asking price for his goods, until the point at which the possessor becomes willing to enter the marketplace and buy. While many may see this as “good business” or “driving a hard bargain”, it is hardly “to love thy neighbour as thyself”. Now in a world where currency is created by private corporations called banks, in the form of debt, at interest, for profit, the scope for aberrations, manipulations and distortions is vast. On the one hand, when there are consumer expectations of being able to access ever more currency in future (wage growth, debt), such as during “easy credit” periods, this will not only keep producers happily shifting product; in some (many) examples it will keep prices low due to growth in competition from new producers offering essentially the same “widget”, in other examples (typically the markets for “assets”) it will result in price increases due to competition between Suppliers (of currency). When there are consumer expectations of having less currency to spend in future (eg, “tight” credit conditions, whether due to banking policy, OR, approaching exhaustion of one’s household debt servicing capacity), the reduced Supply of currency in the marketplace puts the squeeze on the Demanders of currency; current stock is “cleared” by discounting, new production falls, industry competition contracts due business failures and consolidations, unemployment rises thus reinforcing the “cycle”. What is needed, is a currency system that minimises the natural inequity (due entropy) between Suppliers of currency, and Demanders of currency. Op8 Re currency advantage in a world of unlimited resources you may be right. In this world i don’t think so. There is a place for storage (saving)be it of materials or currency. This is a really important notion and one the so-called Keynesians hate. Storage gives us flexibility and a ready supply of materials if we change production due to changing circumstances and demand. e.g. It’s the problem that is not seen by those who advocate lower interest rates to stop savings. If your materials and resources use is already reasonably fully allocated, even if badly, it is difficult to change your economy. If you continue to fund the mis-allocation it is nigh impossible. Under the present system our currency does deteriorate. The problem is, the rate at which it actually deteriorates, versus the rate at which the wider populace believes it is deteriorating, is masked by numerous distortions and (deliberately, IMO) false signals. For example, the usury rate being offered on deposits at any time is one distortion – that creates a sense of the “storage” value of currency. The risible “CPI” indicator is another, and a conflicting one at that since it should accurately signal the deterioration rate of currency. Under such a system, over-consumption by any individual would immediately identify them to all others with whom they might try to conduct transactions, as being an increasingly dishonourable person. I thought my link to John Papola’s article would draw a response! MB readers interested in this issue should also read Livingstone’s response. The comments on that are worth reading as well. You know this bloke hasn’t a clue right there! What world does this bloke live in? He doesn’t seem to have noticed that the great majority of bank loans are not to business at all, nor that the amount of loans vastly exceeds the amount of deposits. Assuming that you are right, i.e. that there is no clear boundary between Consumption and Investment, doesnt that also hurt the case for those who dispute Say’s Law? 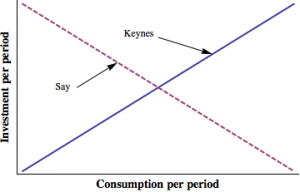 How can you say “there is no trade-off in the short term, and the blue line labelled Keynes in the above graph more accurately represents the relationship between investment and consumption” when you have just admitted you don’t know the difference between investment and consumption? Not at all. Actually, admitting that goods are often capital simply means that if you increase spending in the economy – by circulating money faster or increasing the money supply – you typically increase production of capital and consumer goods. Depending on the type of spending, it could shift the balance towards capital (spending on infrastructure) or consumption (spending on personal services). Suppose the RBA issued $1m cheques to each household and business in Australia. That would boost production of capital and consumer goods, right? If there is some slack in the economy so that production can increase, some unemployment, then more spending will increase production. However, your $1million per household is actually 8.5x the total GDP of Australia, and if you include businesses, then closer to 11x annual GDP. Inflation is the limiting factor on spending (and in your case would be completely blown out of the water), whether it be the result of private or public debts increasing the money supply.